Bishop Don Sproxton speaks with Prof Anthony Kelly, who this week spoke about the topic of Laudato Si. Photo: Desire Photography. Held at the Redemptorist Monastery in North Perth on Tuesday 18 July – was co-hosted by the Centre for Faith Enrichment (CFE) and the Justice Ecology and Development Office (JEDO). Speaking to an audience of more than 50, Professor Kelly explained how Pope Francis has placed faith at the centre of contemporary concerns for the environment through his encyclical, which calls on Catholics to protect ‘our common home’. Far from being separate issues, faith in God and care for the environment could be seen as united, he said. “It’s not about replacing our Christian faith with some vague nature mysticism. No, it’s dead-centre on Christ. ‘In Him all things were made’,” Professor Kelly said. He added that Jesus’ human status and life on earth also emphasised the importance of creation itself. “It might sound a bit odd, but the Word became an earthling. Not on Mars, not on Pluto, not on Jupiter, but on earth,” Professor Kelly said. 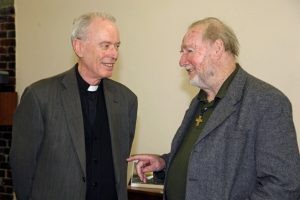 The topic of Christian ecology is well-known to Professor Kelly, with his publication in 2016 of the book, An Integral Ecology and the Catholic Vision, which formed the basis of his presentation. He said it was a welcome addition to past encyclicals which have also directed the faithful to consider social, economic and political issues. This specific focus on the environment was new, however. “They are wonderful words, unprecedented in theological history,” Professor Kelly said. Visiting theologian Professor Anthony Kelly, of brought new perspective to Pope Francis’ 2015 encyclical on the environment, Laudato Si, at a seminar earlier this week. Photo: Desire Photography. And while pressing environmental problems such as climate change could weigh heavily on people’s minds, Pope Francis has urged us to approach them with joy and dedication, he said. “‘Let us sing as we go’ he says. In our struggles and our concerns for this planet, never take away the joy of our hope,” Professor Kelly said. The seminar was broken up into three sections, including a session of questions and answers, an introduction by CFE Director Dr Marco Ceccarelli and a presentation by JEDO Director Carol Mitchell on practical steps that can be taken to protect the environment.